If you are not doing some loaded carry variation in your training – you are missing out big time! If you want to improve sport performance, build brute strength, burn fat, improve your real-life-functional strength or be ultra-efficient with your limited training time, you want to do loaded carries. One of the best loaded carries is the farmer’s walk. Since I have already written about the benefits of farmer’s walks, it’s time to look at how to effectively program this amazing exercise and show you how you can get to your goal. Also, even if you have no desire to pick up and walk holding 500lbs, you can still apply many of these tips to the pursuit of your fitness goals. Last week I hit another milestone training goal – picking up 500lbs and walking in across our high-performance training area. While most people have an idea of what they want, it is far from a specific goal. Set a specific goal. "Getting Stronger" is not a goal. My goal was to do a farmers walk with 500lbs. If it is a big goal, set some milestone markers along the way. My first milestone was doing a body-weight per hand farmer’s walk. Once you have set a goal, let that dictate your programming. Your goal should not only dictate what you do in training – it should also dictate what you don’t do in your training. You only have so much time and energy to work with. Also while heavy lifting is great, it does take its toll on the body. You have to stay within a level of heavy lifting that allows you to get stronger without accumulating nagging injuries or burning out. There are lots of great exercises (e.g. Olympic weightlifting variations, other deadlift accessories) that I had to back down on to make room for farmers walks. Also, heavy Farmer’s walks can really beat up your hands. 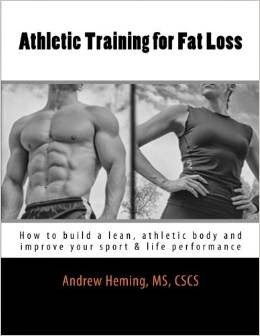 There are many other things that I would have liked to include in my current training program (e.g. heavy-duty gripper work and rope climbing) that I had to leave as it was just too much for my hands to handle. While the farmers walk can help your squat, deadlift and upper body pulling, these lifts can also help your farmers walk. Make sure you are picking appropriate variations of squatting, hinging, pushing and pulling and getting stronger on these lifts. Beginners can start doing farmer’s walks with dumbbells or kettlebells. However, if you want to move some serious weight, you need to get actual farmer’s walk bars. They run about $200 on Amazon and are well worth it! Another alternative that works great is using a trap bar – ideally one in each hand. I used these before we bought the actual farmer’s walk handles. Here is an old video of me doing farmer's walks with trap bars. Chalk is essential for many lifts and heavy farmers walks are definitely one of them. 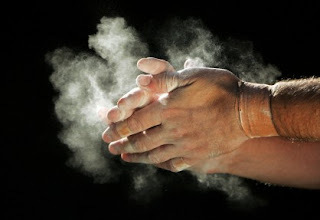 If your gym doesn’t let you use chalk, you need to find another gym or train at home. One effective strategy for programming farmers walks is with a heavy/light weekly layout. I often group all my heavy leg work on one day. On Mondays I do heavy deadlifts, front squats and farmers walks. Then, on Thursdays I do explosive power, rep work and sled pulling. Yes, the heavy day is brutal, but then I get a whole week before I have the next heavy session. The lighter speed and rep work almost acts as a deload on the joints and leaves me fresh for the next heavy day. This system has allowed me to go longer between full deload weeks and make steady progress. 10 seconds is about as long as you can go before your high-threshold motor units start to tap out. For more information, check out this excellent video by Chad Waterbury. After about 10 seconds, you start to need to breath a lot and this is very difficult to do while holding heavy weights and trying to stay tight. I tried slightly longer sets and found that near the end I got wobbly and sloppy as I gave up tightness for oxygen. This is a great way to train for big lifts – especially as you get stronger. The goal is to start with a moderate weight and then have 2 evenly-spaced jumps to get you to your heavy weight. Training is never a purely linear journey. If I got sick or burned out and needed to take a week off, I would drop the weight back a bit from where I was and build up from there. I know this sounds obvious, but it is critical. I have been doing heavy farmer’s walks as a regular part of my training program for about three years now. Success with any goal starts with showing up – consistently! While very challenging to do, the farmer’s walk is a very easy exercise to progress on. I started with 165lbs per hand. I would typically add 2.5lbs per hand each week. Slow, steady, consistent weight increases add up BIG TIME over time. The week before I did my 500lb farmers walk, I did 495. Sure I probably could have done the even 500 that session. However, I care more about my long-term success with training and staying injury free than I do about trying to rush the process. Don’t get greedy with your goals. Like father, like son - my son get's ready for a big set of farmers walks! How about you? What is your experience with farmer’s walks? Have you tried other programming strategies? I welcome your comments/questions below or on my Facebook Page. This site gives opinions and information on all the useful tips. Definitely a good read and advise that can be used on everything we do on a daily basis. It's unfortunate that the farmers walk is mostly define as a method to improve grip strength which causes me to believe that that one who wrote it has never done it. since implementing the farmers walk into my routine, it has strengthened my body overall; I have seen the result when squatting and on my deadlift. The Simple awareness of actually grabbing the bar as strong and as tight as I can, has resulted in easier PR's along with the ability to do bent over barbell rows with much heavier weight with ease. Granted, after doing the farmers walk, I also include 4 to 5 sets of shrugs with the same weight which does help greatly and don't worry about the number of reps because the intensity of each attempt is what matters most not the number of reps but that is another story. I am wondering if the reason why the farmers walk is not as popular is because it does not produce apparent muscles for showmanship? well, better for me, at least I have the gym runway to myself oppose to having to wait on line for someone to finish walking around with a dumbbell in one hand a cellphone on the other taking selfies..I hate the farmers walk at the gym but the cold weather dictates my setting.